The focus of the martial arts program is on fitness, self-defense, personal challenge and growth along with total mindbody wellness. Students practice self-defense techniques, Shaolin Kung Fu open hand forms, weapons, sparring, meditation, strength training, and aerobic conditioning. This dynamic approach allows for rapid advancement in fighting skill, balance, dexterity, and endurance. 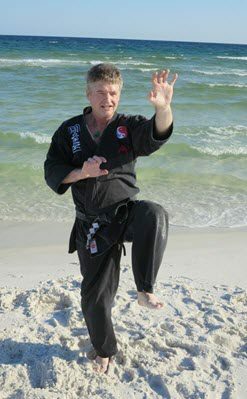 Before attaining black belt, the student will learn 21 long forms covering 7 different Kung Fu open hand systems and 6 weapons forms, as well as over 50 self-defense techniques practiced against a partner using simulated street attacks. In the process each student will have overcome numerous physical and mental barriers that seemed previously insurmountable. Beyond that, they will have achieved things that were completely unknown as even a possibility. It’s this transformational process, and its applicability into everyday life, that is the true fruit of martial arts training. You are welcome to schedule a free trial class to see if our Kung Fu program is right for you. We generally invite prospective students to attend a beginner class for their free trial. Arrive a few minutes early to sign a waiver form and to meet your instructor and fellow students. Wear something loose-fitting and comfortable and bring a water bottle and small towel. Remove all jewelry and shoes before starting class. In the Shaolin temple, there were only four recognized levels: student, disciple, master, and grandmaster. Our Great Grandmaster, Ie Chang Ming, introduced the use of colored belts to divide the material between student and disciple into five levels (white, yellow, blue, green, and brown). One form from a new animal and weapon system is taught at each level above white belt. 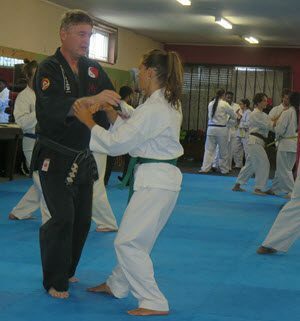 Keep in mind that for a student to pass into the next rank, he/she must perform all the material for their present and all previous belt levels. Black belt degrees, one through four, are considered Beginners Black, while fifth degree is called Associate Master. Once a person reaches sixth degree they are considered full Masters. The rank of ninth degree is considered a Grandmaster, but the position of tenth degree is held by only one person- the highest of the Grandmasters is Grandmaster Sin Kwang The’. While there can be many 9th degrees (there were often ten in a temple), there can be only one 10th degree black belt. This person is given the awesome responsibility of assuring the continuation of Shaolin in its purest form.